The facts in the Project are contained in this website: The 50-year plan for a massive Quarry and Asphalt plant (Newman Ridge and Edwin Center North) which would be located only a mile from Ione, creating irreversible changes to Ione’s local wells and groundwater, desperately needed by ranching and farming in the area. The projects would create serious wastewater issues in and around Ione, will create new heavy truck congestion on local 2-lane roads, add high decibel noise pollution and send up millions of tons of toxic dust, which would contribute to air pollution. The projects would also cause irreversible damage to rare endangered biological resources and will generate critical negative impacts to the Public's Health. Details, videos, interviews and our legal documents, are all contained in this website - including the Timeline - on the Legal Documents Tab. ​The Quarry and Asphalt Projects would permanently destroy an agricultural, rural community. The jobs and revenue numbers associated with the projects are very small and do not benefit local citizens. Did the County address or mitigate these concerns? No, they did not, which is why opposition continues to grow, and we are pursuing an Appeal to reverse the local approvals. Take a moment to review our choices - dozens of ranches and farms could go bankrupt without agricultural water that this project threatens. We will lose the quality of the air we breathe. Our health will be affected. We will smell it. We will see it. We will hear it. The two lane roads we travel, the sights we see every day, the wildlife we appreciate, the water we need and all the reasons we currently enjoy life in the Ione Valley... are at stake here. ​We are now pursuing a higher Court of Appeal outside the county. Please Donate Now by mail or on our website to our Legal Fund to stop these super-polluting and destructive projects, thank you! 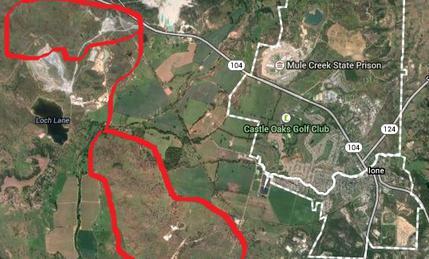 In photo above, proposed quarry and asphalt plant are outlined in red. City of Ione is directly SouthEast so prevailing winds will blow toxic emissions , noise and dust from both quarry and asphalt plant directly toward Castle Oaks and Ione. Life near an Asphalt Plant.